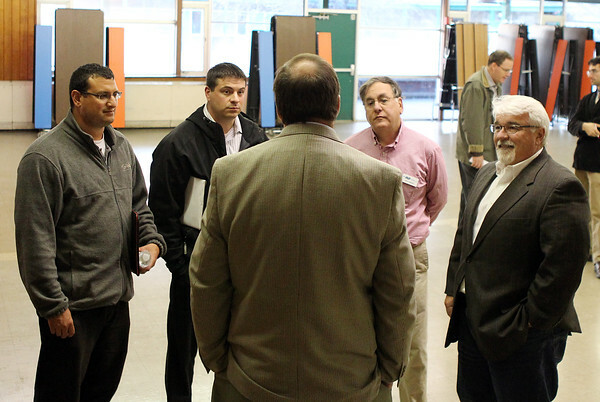 From left, Jonathan Tapper, of Home Decor Group, Jason Corbett, of California Paints, Bob Freeman, of PIP Printing and Marketing Services, and Donald Kelley, President of Wayside Trailers, talk with Robert Gilchrist, center, Executive Manager of Agostini Bacon Construction, at a vendor fair held at the Higgins Middle School in Peabody for businesses interested in selling their products and/or services to the general contractor who is building the new middle school. DAVID LE/Staff photo. 11/18/14.